There are perhaps two dozen well-known boxing stories of substance, ranging from Jack London’s A Piece of Steak, and Fifty Grand by Ernest Hemingway, to more popular fare, such as sports writer Damon Runyan’s Bred for Battle and P.G. Wodehouse’s The Debut of Battling Billson. More recent stories by Rick Bass’ The Legend of Pig-Eye and Thom Jones’ Sonny Liston Was a Friend of Mine would surely be included, as well. Anyone wishing to expand the list to include novels would have some classic fare to choose from: Harold Robbins’ A Stone for Danny Fisher instantly springs to mind, along with the excellent book, The Bruiser by actual boxer-turned-author Jim Tully. There are a lot of boxing stories out there, along with boxing fans who are writers of one stripe or another; from Alexandre Dumas to Arthur Conan Doyle, from Norman Mailer to Joyce Carol Oates, it’s easy to find books waxing rhapsodic about the Sweet Science as literature, as metaphor, or as simply a cracking good read. And yet, there is one name always missing from the Table of Contents pages of the Best Boxing Stories of Forever and All Time (Until We Make Another Book Just Like This One) and that’s Robert E. Howard. Most people know him, if at all, as the creator of Conan the Barbarian. They may know that he was a Texan, who wrote a bunch of pulp fiction stories in Cross Plains, Texas in the 1920s and 1930s for magazines like the legendary Weird Tales. If they know anything else, it’s that he died young, at the age of 30, by his own hand. They almost never know he wrote over sixty boxing stories from 1926 to 1936, including some poetry, which were his bread and butter during his early writing career. Most of the stories centered on Sailor Steve Costigan, a ham and egg fighter sailing on the merchant marine Sea Girl. He – and some of his other, later fictional brothers – spent their days in the ports of call in the Asiatic Seas. They scrapped to survive, for the honor of a beautiful girl, or for a fellow sailor in trouble. Full of humor, incredible boxing sequences, and double and triple crosses, all told from the point of view of Sailor Steve himself, one of the most unreliable narrators to ever grace the page. Howard also wrote some serious boxing stories, such as the novella The Iron Man, but his meat and potatoes were found in these bawdy burlesque boxing stories. Howard was a lifelong boxing enthusiast. He read about it, he wrote about it – hell, he nearly lived it. Himself an amateur boxer, Howard participated in a number of both gloved and bare-knuckle matches with the local roughnecks in his home town of Cross Plains. He wrote about these fights, and traveled far and wide to see local and regional matches and exhibitions. Howard even wrote a number of unfinished essays to gather his thoughts on boxing into one place. These thoughts, these ideas of Howard, while unfinished and unpublished in his lifetime, ended up elsewhere, hidden deep in his fiction as a primary motivating influence. When I first encountered Howard’s boxing stories, I knew none of this. I was just a fan of the Texas author’s work. I’d read Conan, of course, and his other hero-kings, Bran Mak Morn, and King Kull. I was familiar with some of his other heroic writings, but I’d never seen any of his boxing stories before. The book was The Incredible Adventures of Dennis Dorgan. On the cover was a stereotypical evil oriental – a Fu Manchu villain straight from Central Casting. This was modern-day fare by way of the 1920’s. Intrigued, I bought the book and took it home. The first story I read wasn’t the first story in the book. Instead, I skipped right over to The Destiny Gorilla, a title I maintain to this day is technically perfect for so many reasons. As soon as I started reading the story, I knew I was in uncharted waters. Gone was the florid, compact language of Howard’s dark fantasy stories. This was light, wide-open, riddled with dialect and malapropisms, and really funny dialogue. I started laughing, and I laughed all the way through the story. I was still laughing when my roommate and fellow Howard fan came home. He put up with me for about fifteen minutes, and then demanded to know what I was doing. I gave him the book, and within two pages, he was laughing, too. We spent the rest of the evening wondering out loud why we’d never seen any of this before now. That night, we both became lifelong fans of Howard’s boxing stories. And we weren’t even reading the best of his boxing work. Years later, when I starting looking seriously at studying and writing about Robert E. Howard, I joined what was then ground zero for such folks, REHUPA – an amateur press association that stands for the Robert E. Howard United Press Association. When I joined, I expected to be the only person interested in the boxing stories. I was wrong. There were two others: Leo Grin and Chris Gruber. Both had come to the boxing material, just as I had, and come to the same conclusion as me – why didn’t more people know about this? In fact, we all joined with the idea of cracking open the boxing stories and showing these other Howard fans what was what. We banded together, and right from the start, we began elevating each other’s work. There were conversations, revelations, shared information...it was heady stuff. We were the outcasts among the outcasts, writing with something to prove. We knew this stuff was great. We just had to show other people. One of the areas of interest we shared was in sifting through Howard’s work to find his influences. His unpublished essays and stories were invaluable in this area. Chris Gruber’s essay, Atavists, All?, was a lightning rod pointing to Howard’s utilization of the kind of throw-back boxer he admired, first mentioned in the unpublished essay Men of Iron, was the model for every single Howard character in his heroic fiction canon. While pouring through the names of boxers in Men of Iron, Leo wrote a huge essay about Joe Grimm, who was prominently mentioned in essay. I became enamored with another real-life golden age boxer listed alongside of Grimm – Sailor Tom Sharkey. I don’t know what it was about the name, or maybe it was the story Howard included in the essay about Sharkey being knocked out of the ring on his head, and getting up to finish the fight, that intrigued me, but something took hold, and I began to research Tom Sharkey in earnest. And thus began my quest. I chased down every scrap of information I could find about Sharkey. He was one of the most feared and respected boxers in the Golden Age of the sport – just after the reign of John L. Sullivan. Sharkey trod the squared circle with the likes of Gentleman Jim Corbett, Bob Fitzsimmons, and – perhaps his greatest nemesis – Jim Jeffries. These were some of the biggest, hardest hitting fighters of all time. 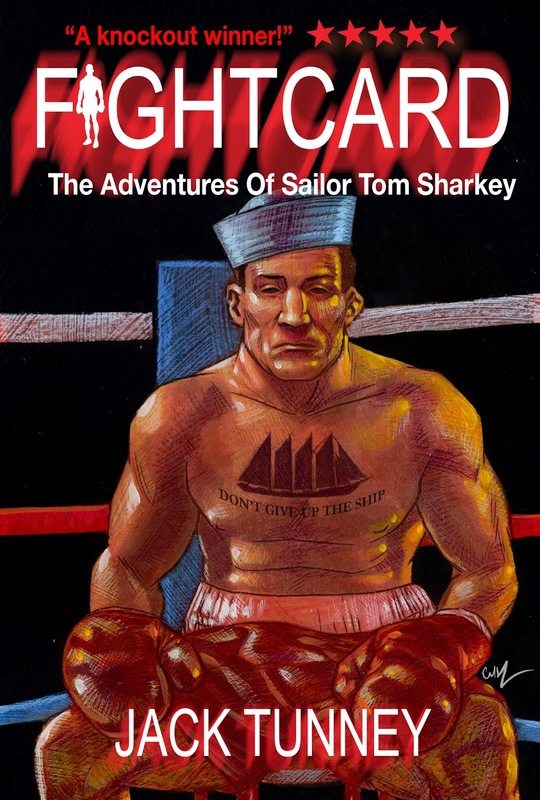 And they all said Sailor Tom Sharkey gave them their toughest fights. Standing only 5’8” or 5’9” depending on who you ask, Sharkey had a 46” chest and thick, muscled arms he honed from his years at sea in the merchant marine, and later, the U.S. Navy. Born in Dundalk, Ireland, in 1874, he ran away at the age of 12, and managed to make it all the way to America as a sailor by the time he was 17. He traded briefly as a blacksmith before signing on to a hitch in the Navy. When he arrived in San Francisco, two years later, he was ready to begin his fighting career in earnest. Because of his size, and his Irish accent, no one took him very seriously at first. Even then, there was a frequently debunked myth that all sailors were decent brawlers, but against an actual student of boxing, stood little chance. Sharkey wasn’t the best public speaker, and he looked like a dub – his chest, for example, was festooned with a tattoo of a four-masted schooner and the motto, Never Give Up the Ship. He was Popeye twenty years before E.C. Segar created Thimble Theater. Sharkey’s initial matches were literally intended to be good sport for better boxers and nothing else. But Sharkey surprised them all when he charged the local champions and kept them on the run for eight straight rounds. He could absorb massive amounts of punishment, and his punch was devastating. Early opponents learned this the hard way after waking up on the canvas, wondering what hit them. Sharkey quickly rose through the ranks to become a contender in San Francisco. He had his eye set on the heavyweight championship. His professional career was as controversial as it was colorful and storied. Sharkey wasn’t so much a fighter as he was a force of nature. His preferred method of boxing was to come out swinging and not stop until his opponent was down. He didn’t mind taking a few punches in order to get in close with those tree trunk arms and that fireplug torso and whale away on the other guy’s ribcage – and if a couple of kidney punches landed, too, well, no hard feelings, eh? Not quite. Fouls, low blows, and other controversies dogged Sharkey and made other opponents wary of stepping into the ring with the Irish scrapper. His reputation notwithstanding, Sharkey tried several times to wrest the belt from champions, only to end in bitter defeat. One of his most bizarre fights was against lanky Bob Fitzsimmons, another blacksmith-turned-boxer whose punch was legendary, despite his unassuming appearance. The match, refereed by none other than Wild West lawman Wyatt Earp, was awarded to Fitzsimmons because of a low blow thrown by Sharkey that Earp observed. The incident actually ended up on court, with Sharkey alleging Fitzsimmons faked the injury because he knew Sharkey would beat him. The judge abided by the decision, and Sharkey never got a rematch with Fitz. But the most storied battles of Sharkey’s career were his two brutal fights with Jim Jeffries. The second fight, in particular, is the stuff of legend. It was the first boxing match filmed and shown in movie theaters. The Klieg lights used to illuminate the ring were so bright and intense that it singed both men’s scalps. Sharkey fought Jeffries to a standstill in 25 grueling rounds that nearly did both boxers in. Sharkey fought the last four rounds with three broken ribs. He was certain he’d beat Jeffries, but the referee didn’t agree. Afterwards, even on the mend, Sharkey threatened to throw the ref into the Atlantic Ocean if he ever caught up with him. Sharkey’s post boxing career was just as colorful, and involved him opening clubs, getting embroiled in Tammany Hall politics in New York City, betting large sums of money on the horses, getting married twice, widowed once, and divorced once, and later, in his fifties, going on the Vaudeville Circuit with former nemesis Jim Jeffries and recounting their famous fights for the crowds. Sharkey loved to spin yarns, and some of those he told people over the years were colorful and, um, hard to prove, such as the notion he was shipwrecked four times in the Merchant Marine. Over the years, sports writers, reporters, and fellow boxers had amusing Tom Sharkey stories to tell. Most are affectionate in their good humor. Some are just downright funny. These anecdotes and snippets were all published during the time Robert E. Howard was reading about boxing. I was certain I’d found the framework upon which he built Sailor Steve Costigan. These findings and essays made their way into various books, introductions, and lectures. By this time, I’d corresponded with most of the people who had written anything about Tom Sharkey, including the author of the first real biography of the man, I Fought Them All: the Life and Ring Battles of Prizefighting Legend Tom Sharkey, Greg Lewis. To a person, they were all happy to share in their research and enthusiasm for this colorful fighter. At this point, I’d been engaged in this pursuit, on and off, for five or six years. As my file on Tom Sharkey grew ever larger, and my parallel study of Howard’s boxing went ever deeper, I felt an urge to write some funny boxing stories of my own start to take hold in my brain. This was folly, of course, and I’ll tell you why. It has been scientifically proven over the years that one cannot copy the writing style of Robert E. Howard. It just can’t be done, and we know this, because it was tried...a lot...with terrible, terrible results. Howard’s writing style was literary lighting in a bottle. It was alchemy. Mercurial. It can be imitated, to some degree, but it can never be duplicated. The reason for this is simple – no one writes from the head space from which Howard wrote. His work was very personal, and unless you have the exact same set of interests, pressures, and irritants, you’ll never make pearls the way Howard made them. Add to that the fact that doing a Sailor Steve Costigan story involved writing funny, and you’ll see the task is nigh-impossible. Writing in someone else’s humor style is even harder than writing in someone else’s literary style, and if you tried to do a Sailor Steve Costigan story, you’d have to do both. I’m no fool. Whatever marginal cache I had as a Howardist would be shattered if I tried to write something in the style of Robert E. Howard, a practice I’d publically pooh-poohed many times. No, if I was going to do a humorous boxing story, it would have to be original. My own thing. I knew I could write about the fights, and I was pretty sure I could make it funny in my particular way, but I was floundering as to what this boxer would look like, and how he’d actually be different from Sailor Steve. The inspiration came to me during a writer’s retreat in 2007. My former writing group and publishing consortium, Clockwork Storybook, got together at Naulakha, Rudyard Kipling's house in Dummerston, Vermont, and we spent a week in seclusion, writing and critiquing, just like the old days. Literally three days before we were set to meet up, it occurred to me there was no better unreliable narrator than Tom Sharkey himself. He went around the world, did all of these amazing things, and like any old campaigner worth his salt, wasn’t going to let the truth get in the way of a good story. There were a lot of “blank spaces” on Tom Sharkey’s map – periods of time no one can account for, including the years he spent with a traveling carnival, recreating (and sometimes rehashing, at the age of fifty, no less) his fights with Jim Jeffries. I wrote the first Tom Sharkey story – what would become Sailor Tom Sharkey and the Introduction Window (the original title was An Excerpt from the Unexpurgated Adventures of Sailor Tom Sharkey) – right before I left for Vermont. I planned to read it for the guys, and get their notes. During the retreat, I wrote another story based on a writing challenge we all set for ourselves. This one, The Final Adventure of Sailor Tom Sharkey, has since been renamed Sailor Tom Sharkey and the Real McCoy. It has also been edited and rewritten somewhat to strip out most of the challenge conditions of the exercise. I kept the cow skull, though, which worked out quite well. When I read the group my first Tom Sharkey story, it was with very little preamble. I just told them this was something I’d been working up to for a while. To my complete surprise and pleasure, they loved it. Most of the comments were along the lines of, “I can’t tell if this is good writing from you or not, because it sounds just like you.” The second story, written a few days into the retreat, met with similar notes and a caution to be careful not to have them all sound alike. “I mean, how often can you write about a big dumb sailor who doesn’t ever get what’s going on around him?” one of them quipped. Oh, ye of little faith. Other Tom Sharkey stories began to suggest themselves, and I dutifully noted them down when inspiration struck. The hardest part of writing Tom Sharkey is avoiding “Costigan Creep,” when certain key phrases and things find their way, in quantity, into the stories. Do it once and it’s a nice little Easter egg nod to fans in the know. Do it twice, or thrice, and then it becomes second-rate Robert E. Howard. More than once I’ve had to pull myself back, all in service to the story. I should also mention that over the span of several years and several stories, my fictitious Sailor Tom Sharkey has taken on a life of his own, one that is suggested by the real fighter, but has in the retelling become someone else altogether. I’ve based many of these stories on real events in Sharkey’s life, but these are in no way intended to represent real people or real events, and none of the stories in this collection are intended to supplant the real Tom Sharkey’s biography in any way. If you want the details of the man behind the legends, see Greg Lewis’ book, mentioned above. In between writing other things, I’d occasionally let one fly, and when finished, I sent each one far and wide, looking for a home. They were, not surprisingly, hard to place. There is not, nor has there ever been, a sub-genre of the literature section labeled “humorous historical weird boxing stories.” An oversight, no doubt. My submissions, to editors of big and little stature, all came back rejected. Those that added any commentary frequently told me they liked the story, but had no idea what to do with it. I wasn’t surprised. These have been a hard sell. Thank heaven for Fight Card. Now, at last, you can. I’m grateful to Paul Bishop for giving me the chance to publish this collection under the aegis of what has become a respected line of quality fight fiction, and ground zero for fans of this kind of literature. If you are such a fan (and why wouldn’t you be?) and you have not read Robert E. Howard’s boxing stories, you really need to. You’re missing out on one of the most memorable and critically underrated achievements from one of the world’s greatest pulp fiction writers. If you’re already one of us, then I hope you’ll enjoy these stories in the spirit in which I wrote them.